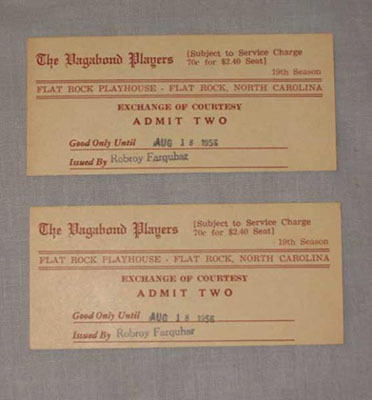 The General Assembly of 1961 adopted Flat Rock Playhouse as the official theatre of North Carolina. The Flat Rock Playhouse is a professional nonprofit theater company in Henderson County, North Carolina. It dates its origins back to 1937, when British actor Robroy Farquhar organized a traveling troupe of theatre professionals, calling them the ‘Vagabond Players.’ The Players performed throughout the country until one winter, while working in Florida, Farquhar heard about the popular summer vacation areas in the mountains of North Carolina. The troupe arrived in the Blue Ridge region in the summer of 1940. They converted a 150-year-old grist mill in Henderson County into the Old Mill Playhouse, becoming North Carolina’s first professional summer theater. The venture was wildly successful, and the players returned for a second summer in 1941. The Troup was disbanded during World War II, as some of the players were serving in the military. They returned to Western North Carolina in 1948 after the war and continued their craft, opening the Lake Summit Playhouse. The venture was once again successful, and after several seasons the troupe decided that they needed a larger space. In 1952 Farquhar and his performers developed their troupe into a nonprofit educational and cultural corporation. They appointed a board of directors and purchased an eight-acre lot in Flat Rock, North Carolina, which they built into a permanent home. In 1961, the Flat Rock Playhouse was officially named the State Theatre of North Carolina by the General Assembly. Today, the playhouse produces a 9-month season featuring Broadway musicals, plays, and children’s theater. Their education division includes an internship and apprentice program as well as year-round theater classes for children and adults. The Playhouse is host of over 98,000 patrons a year and has been called one of the top ten theaters in the country.